Drop-off will be held for 3 days! An extended drop-off period eliminates any excessive back-ups in the registration process, while providing you with more personal attention and allowing our quality control gals to do a more thorough job. We will be using our highlighting system to divide you into smaller “drop-off” groups. Please refer to the chart below and/or check-out our event schedule to find your specific drop-off day. If you are unable to attend your scheduled drop off time based on your last name, you may come to any of the other drop off times. If you are unable to drop off during one of the scheduled drop-off times and you require an appointment, feel free to contact us. Please make a note in the subject field “Drop-off appointment needed”. Provide us with your name, consignor number and desired appointment time when writing. When dropping off your items you’ll need to plan to be on location for at least an hour. This will allow time to fill out your registration form, check-in through quality control, and put your items away on the sales floor. Allow extra time if you are bringing a “Duck-Load of Stuff”, arrive at peak hours or plan to order and attach your barcodes during drop-off. NOTICE: Please do not park in front of the entrance unless instructed to do so by a staff member upon completion of your paperwork. Please leave your items in your car and come in to the store to check-in. After you sign in, we will let you know when you may begin unloading your items. If you have large items or need to unload near the front door for any other reason please ask permission before moving your car. As soon as you have unloaded please move your car back to the parking lot in order to make room for the next consignor to unload. We need your help to keep the area in front of the doors clear of parked cars during the entire drop-off process. 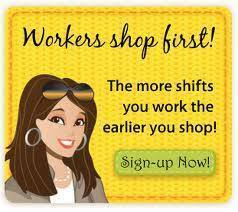 See how you can save $10.00 off your particiption fee- by visiting our workers page. You will be able to request additional barcodes at this time. (NOTE: allow extra time to attach your barcodes. The time will be relative to the number of items you bring). Your items will go through a seasonal and quality control check point. Check-in is not complete until you put your items away. Anything left at the registration desk will NOT be put on the sales floor so make sure you allow enough time to put EVERYTHING in its APPROPRIATE place. THANKS!! All consignors must highlight their tags if you plan to pick-up your unsold items. Use the chart below to find which color of highlighter to use. 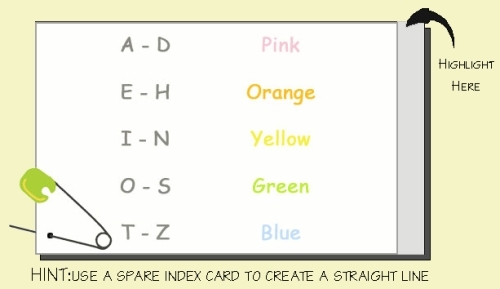 Example: If your last name begins with the letter “M” then you would use a yellow highlighter creating a band of color down the right side of each index card (notice the shaded area). Any unsold items left after 7:00pm on TUESDAY, April 16th, will be donated to worthy charities.